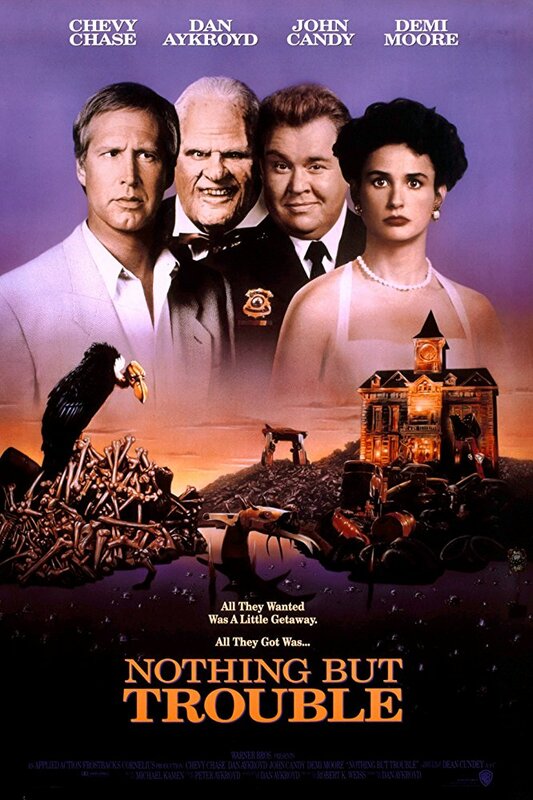 Nothing But Trouble is a 1991 comedy written and directed by Dan Aykroyd and starring Chevy Chase. It was not a box office hit, earning a paltry $8.4 million. Critics raked it over the coals; the movie has a 5% approval rating at Rotten Tomatoes. (As you may have already guessed, the sole outlier is yours truly.) Although it’s developed a minor cult following over the years, NBT is still largely considered a bad movie that came and went without much impact. 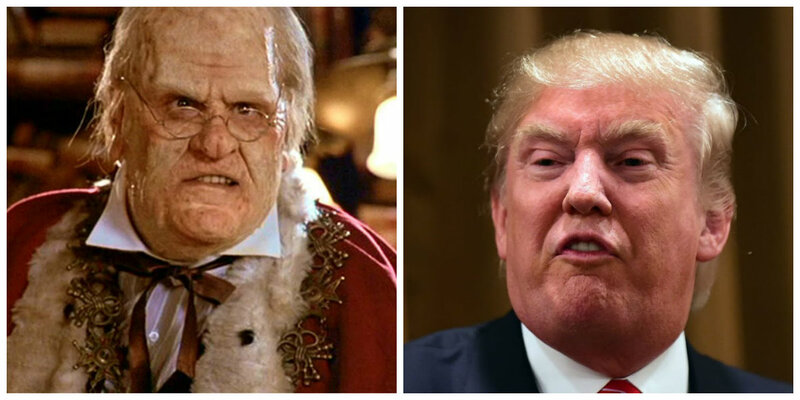 There’s just one thing, though: Nothing But Trouble perfectly predicted life in America under President Donald Trump. In case you’ve never seen it or need a refresher, this is the story of Chris Thorne (Chase), a wealthy Manhattan financial publisher who takes a short road trip to Atlantic City with his lawyer crush, Diane Lightson (Demi Moore), and his Brazilian clients, Fausto and Renalda Squiriniszu (Taylor Negron and Bertila Damas). They pass through a rundown Pennsylvania burg called Valkenvania. When Chris fails to come to a complete stop at an intersection, he is arrested and taken before the local judge, 106-year-old Alvin Valkenheiser (Aykroyd), who issues him the death penalty. Chris then tries to escape the judge’s booby-trapped mansion in order to avoid execution. Although that may sound goofy on the surface, the parallels are staggering. Valkenheiser is like Trump himself — a man drunk on his own power who yearns to be feared by anyone who crosses him. He has an oft-cited hatred for “bankers,” believing them all to be corrupt. Trump, you doubtlessly know, feels the same way about professional journalists. The judge repeatedly denigrates Chris as a banker, despite protestations that he’s actually in publishing. Trump denigrates anyone he dislikes, coming up with childish nicknames (“Cryin’ Chuck Schumer“) or labels (“slimeball“). They both share a disregard for the actual rule of law, believing it should bend to their will. Those unlucky enough to find themselves on that belt will end up going through “Mr. Bonestripper,” a roller coaster that deposits its riders into a contraption that, as the name suggests, thoroughly strips the flesh from their bones. That’s because Valkenvania is a place that has become hostile to outsiders. People like Chris and his friends are viewed as being lesser because they don’t come from the ramshackle town. The local motto could practically be Valkenvania First! At the same time, Mr. Bonestripper also brings to mind the many, many regulations Trump has “bonestripped” away, like those pertaining to climate change and campus sexual assault. Key supporting characters additionally take on eerie familiarity. Out in the scrapyard next to the mansion are Bobo and Lil Debbul, Valkenheiser’s deformed grandchildren. They are pathetically inept nincompoops — barely literate, diaper-wearing imbeciles who, lacking the intelligence to make it on their own, blindly do the judge’s bidding and leech off his faded fortune. 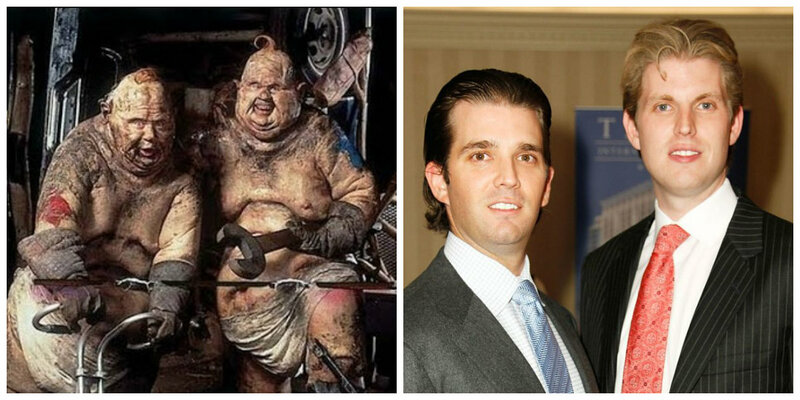 In other words, they’re Don Jr. and Eric. Okay, that was obviously a very mean joke, and I’m so sorry I made it. However, Bobo and Lil Dubbul do call to mind some of Trump’s appointees, like Secretary of Education Betsy DeVos, who has never taught in a public school. Or Secretary of Energy Rick Perry, who mistakenly thought the gig entailed representing the gas and oil industry around the world. (It actually involves dealing with policy related to energy and nuclear material.) Or some of Trump’s district court judge candidates, like the guy who never tried a case and couldn’t answer even the most basic of legal questions. All of them, like Bobo and Lil Debbul, are absurdly incompetent, which puts them in a position of potentially doing more harm than good. Valkenheiser has a granddaughter, Eldona (also played by Candy), on whom he dotes. He talks about how beautiful and special she is, much as Trump has creepily praised his own daughter, Ivanka. In a major plot point, Valkenheiser insists that Chris marry Eldona. 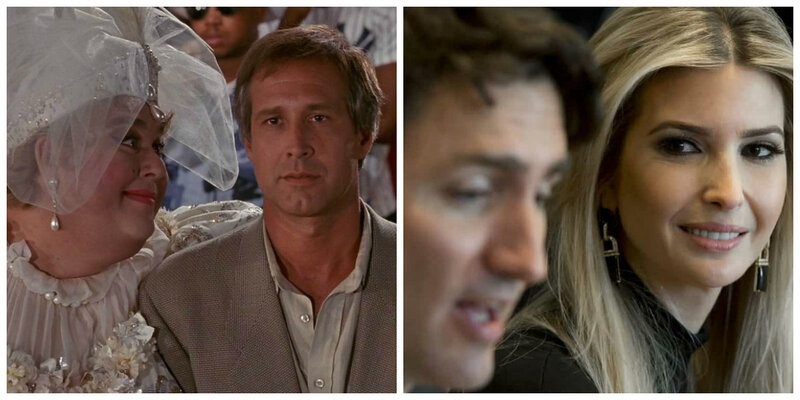 The judge forces her on him, just as Ivanka — a former handbag designer who has not been elected to public office — has been forced upon the world, whether it’s taking her father’s seat at the important G-20 summit, representing the administration by going to South Korea for the Olympics, or being trotted out to make goo-goo eyes at world leaders. Nothing But Trouble ends with Chris and Diane barely escaping Valkenvania after an underground coal fire causes its destruction, helping them to get away. As he sits at home believing he is finally safe, Chris watches a TV news report about the town. The reporter pulls in an interview subject. It’s Valkenheiser. He holds up Chris’s drivers licence, which he previously confiscated. “See you soon, banker!” he exclaims. From this, we realize that the judge is a man obsessed with revenge, much like the current White House occupant. Dan Aykroyd probably thought he was making a silly dark comedy about a weird backwater town and the elite New Yorkers who end up there. Nothing But Trouble is much more than that, though. It’s virtually a look into a crystal ball. Somehow, twenty-seven years ago, Aykroyd instinctively knew what Trump’s America would look like.